Overnight, the euro hit its strongest level against the pound sterling in eight years to 92 pence. The euro has climbed more than 10 percent from a low for the year of 83 pence back in April, and has gained 31 percent since a late 2015 decline to 70 pence. Meanwhile, the U.S. dollar has also been in a steady decline on foreign exchange markets since January. The WSJ Dollar Index, which measures the dollar against the currencies of major trading partners, is down about 8% since the beginning of the year, including a more than 2% drop over the past month. 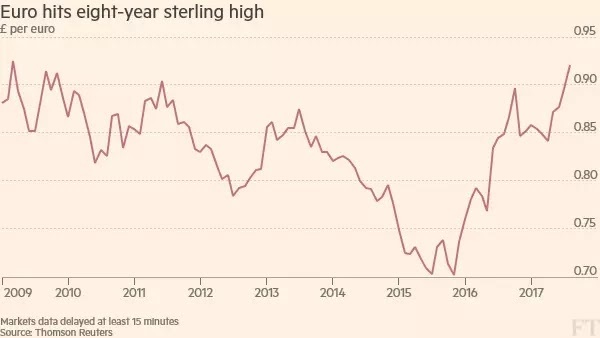 Its decline has been especially pronounced against the euro, declining by more than 11%---the decline this year worse than the decline by sterling against the euro. It is a race to the bottom for all these currencies with the dollar and sterling taking lead positions. This is not going to end any time soon. Buy gold.